Our vast domain knowledge and profound understanding have facilitated us to offer a qualitative team of Hologram Seals And Wads. This offered range finds numerous applications in sealing jars that contains tablets, liquids and powders besides many other. Keeping in mind latest market demands, our range is available in accordance with clients specifications as well. Moreover, for the gratifications and ease of our customers, we offer them our quality approved range at the market leading prices. 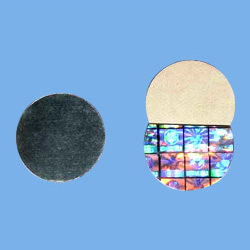 We are extremely pleased in offering our patrons, an exclusive range of Hologram Induction Wads. Induction Wads are leak proof seals applied with induction heating. They are used to seal PP, HDPE or glass bottles/jars containing liquids, Tablets or powders etc. In Hologram Induction Wads, a custom design or a generic security design holographic film (depending upon client's needs) is laminated with aluminium foil to provide security and authenticity to the seal in addition to the normal sealing capability. We are extremely pleased in offering our patrons, an exclusive range of Hologram Induction Seals/ Wads, demand for is very high. Long time service of our offered range has been made possible with the support of our skilled team and are also offered to the esteemed clients at the most competitive price.